I heard screaming in the distance as I hurried down the path. My friend was holding her hand covered in blood. A finger lay on the ground a few feet away from her. I froze in fear for a moment before I composed myself. It was a rubber finger. The blood was fake too. When you are more than a few hours away from medical help, you have to make difference choices than you would at home. In my 20 hour course, we splinted broken arm bones and pelvises. We practiced moving patients with potential spinal injuries when it would be unsafe to leave them. We discussed treatment for shock and hypothermia. It’s a different approach to first aid than when an ambulance is right around the corner. On your last hike, did you take enough food and warm clothing in case you had to stay out longer than you planned? What about an emergency shelter and fire starter? I know that I (like many people) am often tempted to leave safety equipment at home to travel lighter and faster. As we worked through our practice scenarios, it drove home the point that the 10 essentials are just that, essential. You already know you should carry a first aid kit on all your outdoor adventures. But have you taken everything out and looked at it? Made sure you know how to use everything? Taking a course is the perfect excuse to move beyond the Band-Aids and tensor bandages. It’s not just what you have inside your first aid kit, but how creative you can be using objects around you. Taking a wilderness first aid course can help open your eyes to new possibilities. Sticks and Therm-a-rests can become splints. Logs and tarps can be made into makeshift stretchers. Small blankets can be used as a neck brace. 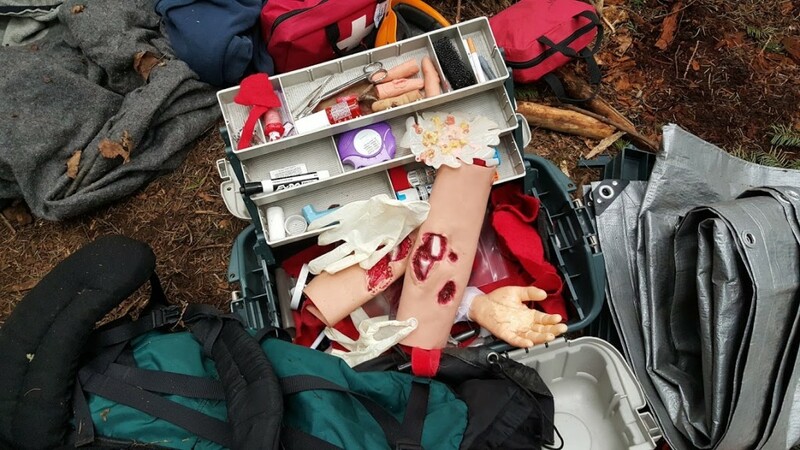 If you want to lead groups outside, Wilderness First Aid is a great place to start. I took my first Wilderness First Aid course to work as a camp counsellor. Taking kids on 4-day camping and hiking trips was one of the most fun jobs I’ve ever had. I just took the course again because I’ve started volunteering with Search and Rescue. As another Rad Girls blog post mentioned, taking a course can also be a great way to test out a career in outdoor education.